Give your home a unique, elegant look that transforms it immediately when you choose tile flooring for your kitchen, bathroom, or any other room in your home. We keep a huge variety of tile floors in all shapes, sizes, colors, and materials in stock at all times. Whether you want natural stone, ceramic, or porcelain floors, we have the variety you need to find the tile that is perfectly suited to your needs as far as looks, price, and durability are concerned. The design specialists that we employ are always available to guide you through the entire process of choosing floors, ensuring that you are able to make an informed decision about the future of your flooring. We are here to provide you with all the information you need on the different brands and materials available to you, even providing mockups of the final product. When you leave our store, you will be 100% confident with the decision you’ve made. With so many options to choose from, you are sure to find the floors that best suit your needs in appearance, performance, and cost. After you choose the right flooring, let our expert contractors help you with tile flooring installation to ensure you get the most value out of your purchase. At the end of the day, we want you to be satisfied with the colors, patterns, material, and end result of your new floors. 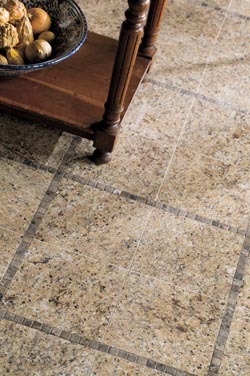 Replacing your older floors with brand new tile greatly reduces the allergens in your home. Tile is also capable, in all of its forms, of repelling water, stains, mildew, and dust, preventing these allergens from sinking down into the surface. Tile makes it simple to wipe any allergens away. However, the reason most people seek porcelain, stone, or ceramic tile flooring is for the versatility of the material. It comes in a wide variety of shapes, colors, and textures, allowing you to match it to practically any design. The experts in design that we employ are ready to help you decide which type of tile is best suited to your individual needs. To do so, we give you access to some of the best brands on the market. When you need the best outcome for your flooring installation, depend on our team for the thorough, meticulous services you require. In terms of installing ceramic or porcelain tile, proper installation not only makes the results even more beautiful, it ensures the durability of the material. A mistake made during installation undermines the structural integrity of the entire floor. We pay close attention to detail when placing each and every tile, making sure everything is aligned properly and that the grout is tightly sealed. Our installers are so confident of their work that we offer a lifetime guarantee that gives you free repairs on any installation-related problems. When you depend on us, you get new floors that last for years to come. Call us today to discover all the tile flooring options we have in store for you. We are proud to serve Great Falls, Monument, Black Eagle, Vaughn, and Fort Shaw, Montana, and surrounding areas.